Improve your Gutter RX leaf covers’ performance during the winter months and icicles will become a thing of the past. As with ANY leaf cover, snow build-up on the panel may lead to some icicle creation. CSG can install our Raychem, self-regulating heat cable system to completely eliminate this issue. We securely attach one strand of heat cable to the top of the Gutter RX panel, to prevent snow from accumulating and install a second strand in the bottom of the gutter and downspout. This second strand of heat cable keeps an open melt path to the ground for the melt water to flow. We can also retro fit the heat cable on most existing gutter cover systems. Xtreme Guard leaf filter is a stainless steel micro-mesh over expanded aluminum product that yields the optimum micron size (440) to prevent all debris from entering the gutter system. This product utilizes a .024" aluminum body and lip that is mechanically fastened over the mesh laminate, creating an exponentially stronger product, in both compression and tension. The embossed texture feature deters debris from "sticking" to the product by minimizing surface contact area, thus augmenting the debris shedding. The front leg of the product screws to the front lip of the gutter and the back upward bend (fascia shield) allows it to be screwed directly to the fascia, creating a slight forward slope. This installation creates unprecedented "box girder" strength, making the gutter assembly, which is inherently weak by nature, a completely closed member. The micro-mesh technology ensures that leaves, twigs, pine needles, oak tassels, shingle grit and other small debris will never breach the system to migrate into the gutters. The mesh is strategically sized to allow passage of pollen and dust so it is washed through during rainfall. It may be necessary from time to time to clean or remove stubborn debris (inorganic & organic) from the mesh surface to maintain the proper performance. As with all Xtreme gutter guard products, NO roof or shingle contact is required. Request a FREE estimate onlineor call 303-447-1555 today! 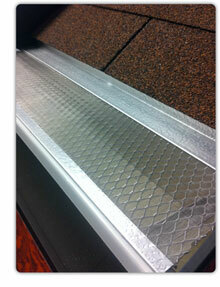 The Xtreme Guard Best gutter cover is simply the best all-round gutter cover on the market. It keeps out everything that can clog your gutter. However, during the winter months, snow can build up on top of the cover and may cause icicles. The solution? Our Heated Xtreme Guard Cover. We incorporate our Raychem, self-regulating heat cable with the Xtreme Guard to create the best "All Season" gutter system money can buy. We securely fasten a strand of heat cable on top of the Xtreme Guard, to warm the panel and a second strand in the bottom of the gutter and downspout to keep an open melt path to the ground. We can also retro fit this heated system on most other previously installed cover systems.